To expound upon their sense of awe and wonder about how their world works. sounds of language in a playful manner. To introduce the names and sounds of letters in a meaningful way. To develop basic math concepts using manipulatives - a 'hands on' process. 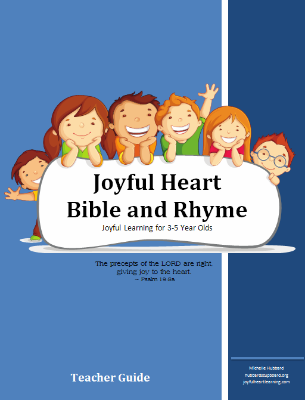 Joyful Heart Bible and Rhyme is a FREE curriculum that is available on this website. However, if you would like a revised/updated version of this curriculum in an easier to print format, please consider purchasing Joyful Heart Bible and Rhyme - an ebook for sale based off of the work published on these pages - compiled, refined, and reformatted making it easier to prepare and use! What's included in the FREE online version? 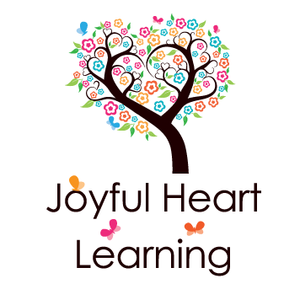 There are a total of 38 planned weekly themes in the Joyful Heart Bible and Rhyme Curriculum, designed to be used during a typical school calendar year (August through May). Each weekly theme, listed below, is based on a Bible story. A nursery rhyme was chosen to correspond with each Biblical text. Phonemic awareness, Bible memorization, a simple science concept, cooking, songs and movement, and letter recognition and sounds are incorporated into each set of weekly lesson plans. The review weeks are intended to be used to review all aspects of the curriculum and to build in opportunities to work with seasonal concepts and activities. The following links will take you to a Daily Plan Sheet, samples of activities, words to songs, and free printables for each week. This is a 3 page sheet to show the full 38 week sequence for phonics, Bible, memory verses, nursery rhymes, math concepts, and science concepts at a glance. A list of Suggested Books to use with this curriculum for the entire year. Just print it out and take it to the library with you!